This bibliography of diamond mechanosynthesis is an updated, expanded and annotated version of a similar earlier bibliography that was first assembled by Freitas on 16 December 2003 and posted online at the Foresight Institute website. It now includes references to mechanosynthetic fabrication employing the broader range of diamondoid materials. K. Eric Drexler, “Molecular engineering: an approach to the development of general capabilities for molecular manipulation,” Proc. Natl. Acad. Sci. (USA) 78(September 1981):5275-5278. ABSTRACT. Development of the ability to design protein molecules will open a path to the fabrication of devices to complex atomic specifications, thus sidestepping obstacles facing conventional microtechnology. This path will involve construction of molecular machinery able to position reactive groups to atomic precision. It could lead to great advances in computational devices and to the ability to manipulate biological materials. The existence of this path has implications for the present. ABSTRACT. We explore the possibility that surface charge induced by the scanning tunneling microscope will influence the structure of the surface under investigation. In general, we find that the emission currents limit the induced charge densities and preclude major structural modifications on the more stable surfaces. However, the possibility of modifying less stable structures or of reducing the transition temperatures for transformation between different surface phases does exist and is discussed in detail. ABSTRACT. Various mechanisms for the sudden transfer of an atom from or to the tip of a scanning tunneling microscope are considered. It is concluded that thermal desorption could be responsible and also that quasi-contact in which the adsorbed atom is in effect "touching" both surfaces, which would still be separated from each other by 2–4 Å, can lead to unactivated transfer via tunneling. For barrier widths as small as 0.5 Å, however, tunneling becomes negligible. K. Eric Drexler, John S. Foster, “Synthetic tips,” Nature 343(15 February 1990):600. EXTRACT. Capabilities in scanning tunneling and atomic force microscopy (STM and AFM) depend on probe-tip properties, but tip properties are at present poorly controlled; suitable tips have poor reproducibility at the atomic level. Techniques for precise control of the mechanical and chemical nature of tip structures would be of evident value. We therefore propose a ‘molecular tip’ made of a protein-like molecule which has been designed to bind to a crystal-corner STM/AFM tip, and which could potentially be tailored, manufactured and reproducible....Strong and adjustable positional control of effective concentration (and hence of reaction rates) on an atomic distance scale appears physically possible in a class of systems that may be practically realizable. ABSTRACT. 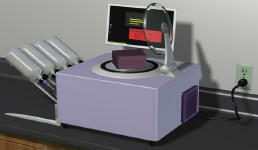 A class of devices based on the atomic force microscope [Phys. Rev. Lett. 56, 930 (1986)] is proposed that would enable imaging with tips of atomically defined structure. These molecular tip array (MTA) systems would enable sequential application of tips with differing structures to a single sample, limited to a small substrate area. MTAs with suitable binding sites can enable nanofabrication via positional chemical synthesis exploiting local effective concentration enhancements of ~108. A method for canceling or inverting the net van der Waals attraction between a tip and a substrate in a fluid medium is suggested, and a new analysis of imaging forces for proteins is presented. NOTE: This was the first book to describe positionally-controlled diamondoid mechanosynthesis. ABSTRACT. The long term goal of molecular manufacturing is to build exactly what we want at low cost. Many if not most of the things that we'll want to build are complex (like a molecular Cray computer), and seem difficult if not impossible to synthesize with currently available methods. Adding programmed positional control to the existing methods used in synthesis should let us make a truly broad range of macroscopic molecular structures. To add this kind of positional control, however, requires that we design and build what amount to very small robotic manipulators. If we are to make anything of any significant size with this approach, we'll need mole quantities of these manipulators. Fortunately, any truly general purpose manufacturing device should be able to manufacture another general purpose manufacturing device, which lets us build large numbers of such devices at low cost. This general approach, used by trees for a very long time, should let us develop a low cost general purpose molecular manufacturing technology. While we have focused in this article on diamondoid structures and molecular computers based on semiconductors such as diamond, it will probably be easier to first make systems that rely on materials that are simpler to synthesize but whose material properties are not as good as diamond. The general concept of positional control, however, still applies. A future article will discuss in greater detail the design of such simpler systems, and how they can form a stepping stone to mature molecular manufacturing. ABSTRACT. The goal of constructing artificial molecular machine systems able to perform mechanosynthesis is beyond the immediate reach of current laboratory techniques. Nonetheless, these systems can already be modeled in substantial detail, and existing techniques enable steps toward their implementation. Mechanosynthetic systems will rely on mechanical positioning to guide and control the molecular interactions of chemical synthesis. The effective concentration of a mechanically positioned species depends on the temperature and on the stiffness of the positioning system. These concentrations can be large (> 100 M) and localized on a molecular scale. Background concentrations can approach zero, thus enabling precise molecular control of the locations and sequences of synthetic operations. Researchers have developed concepts for mechanosynthetic systems and defined general technology requirements. One approach to the fabrication of molecular machine systems is the development of AFM-based mechanosynthetic devices. These would position molecules by binding them to (for example) antibody fragments attached to an AFM tip. Development of suitable monomers, binding sites, and reaction sequences would then be a basis for the fabrication of complex mechanical structures. Biological molecular machine systems rely on the self-assembly of folded polymers. A review of progress in protein engineering suggests that we have the means to design and synthesize protein-like molecules with well-defined structures and excellent stability. Success in this effort provides a basis for the design of self-assembling systems, and experience with the design and supramolecular assembly of smaller molecules is encouraging regarding the success of this next step. Development of a molecular machine technology promises a wide range of applications. Biological molecular machines synthesize proteins, read DNA, and sense a wide range of molecular phenomena. Artificial molecular machine systems could presumably be developed to perform analogous tasks, but with more stable structures and different results (e.g. reading DNA sequences into a conventional computer memory, rather than transcribing them into RNA). Self-assembling structures are widely regarded as a key to molecular electronic systems, which therefore share an enabling technology with molecular machine systems. Finally, studies suggest that the use of molecular machine systems to perform mechanosynthesis of diverse structures (including additional molecular machine systems) will enable the development and inexpensive production of a broad range of new instruments and products. Laboratory research directed toward this goal seems warranted. OVERVIEW. In this review, I assess progress in the design and implementation of molecular machine systems by focusing on the fundamental principles of mechanosynthesis and emerging strategies for the synthesis and assembly of large (>106 atom) devices. This chapter describs existing knowledge and capabilities from the perspective of molecular systems engineering and examines key objectives in implementing molecular machine systems. ABSTRACT. If we are to manufacture products with molecular precision, we must develop molecular manufacturing methods. There are basically two ways to assemble molecular parts: self assembly and positional assembly. Self assembly is now a large field with an extensive body of research. Positional assembly at the molecular scale is a much newer field which has less demonstrated capability, but which also has the potential to make a much wider range of products. There are many arrangements of atoms which seem either difficult or impossible to make using the methods of self assembly alone. By contrast, positional assembly at the molecular scale should make possible the synthesis of a much wider range of molecular structures. One of the fundamental requirements for positional assembly of molecular machines is the availability of molecular parts. One class of molecular parts might be characterized as molecular building blocks, or MBBs. With an atom count ranging anywhere from ten to ten thousand (and even more), such MBBs would be synthesized and positioned using existing (or soon to be developed) methods. Thus, in contrast to investigations of the longer term possibilities of molecular manufacturing (which often rely on mechanisms and systems that are likely to take many years or even decades to develop), investigations of MBBs focus on nearer term developmental pathways. ABSTRACT. Scanning probe imaging and manipulation of matter presents is of crucial importance for nanoscale science and technology. However, its resolution and ability to manipulate matter at the atomic scale is limited by the rather poor control over the fine structure of the probe. In the present communication, a strategy is proposed to construct a molecular nanomanipulator from ultrathin single-walled carbon nanotubes. Covalent modification of a nanotube cap at predetermined atomic sites makes the nanotube act as a support for a functional "tool-tip" molecule. Then, a small bundle of nanotubes (3 or 4) with aligned ends can act as an extremely high aspect ratio parallel nanomanipulator for a suspended molecule, where protraction or retraction of individual nanotubes results in a controlled tilting of the tool-tip in two dimensions. Together with the usual SPM three degrees of freedom and augmented with rotation of the system as a whole, the design offers six degrees of freedom for imaging and manipulation of matter with precision and freedom so much needed in modern nanotechnology. A similar design might be possible to implement with other high-aspect ratio nanostructures, such as oxide nanowires. NOTE: A possible method for manipulating the DMS tooltips described in Freitas and Merkle (2008) is presented in this paper. ABSTRACT. Diamond mechanosynthesis (DMS), or molecular positional fabrication, is the formation of covalent chemical bonds using precisely applied mechanical forces to build nanoscale diamondoid structures via manipulation of positionally controlled tooltips, most likely in a UHV working environment. DMS may be automated via computer control, enabling programmable molecular positional fabrication. The Nanofactory Collaboration is coordinating a combined experimental and theoretical effort involving direct collaborations among dozens of researchers at institutions in multiple countries to explore the feasibility of positionally controlled mechanosynthesis of diamondoid structures using simple molecular feedstocks, the first step along a direct pathway to developing working nanofactories. ABSTRACT. Tip-Based Nanofabication as a Rapid Prototyping Tool for Quantum Science and Technology discusses the development of cantilevered nanotips techniques of quantum devices prototyping and how they evolved from scanning probe microscopy. Also covered are the advantages and future prospects of atomic resolution capability and how to use this enabling technology as a rapid prototyping tool for quantum science and technology. ABSTRACT. Since its invention in the early 1980s by Binnig and Rohrer, the scanning tunnelling microscope (STM) has provided images of surfaces and adsorbed atoms and molecules with unprecedented resolution. The STM has also been used to modify surfaces, for example by locally pinning molecules to a surface and by transfer of an atom from the STM tip to the surface. Here we report the use of the STM at low temperatures (4 K) to position individual xenon atoms on a single-crystal nickel surface with atomic precision. This capacity has allowed us to fabricate rudimentary structures of our own design, atom by atom. The processes we describe are in principle applicable to molecules also. In view of the device-like characteristics reported for single atoms on surfaces, the possibilities for perhaps the ultimate in device miniaturization are evident. NOTE: This was the first experimental demonstration of mechanical atomic manipulation using scanning tunneling microscopy. The design constraint employed in this experiment (the use of chemically non-reactive atoms on a metallic surface and cryogenic temperatures to exploit the weak electrostatic interactions between xenon and nickel) is important because it shows that even extremely weakly interacting components can be assembled that persist over both assembly and characterization procedures. ABSTRACT. A scanning tunneling microscope (STM) was used to manipulate the bonding of a carbon monoxide (CO) molecule and to analyze the structure and vibrational properties of individual products. Individual iron (Fe) atoms were evaporated and coadsorbed with CO molecules on a silver (110) surface at 13 kelvin. A CO molecule was transferred from the surface to the STM tip and bonded with an Fe atom to form Fe(CO). A second CO molecule was similarly transferred and bonded with Fe(CO) to form Fe(CO)2. Controlled bond formation and characterization at the single-bond level probe chemistry at the spatial limit. NOTE: Ho and Lee's work explicitly involves tunneling electrons, not mechanical forces, in bond formation. ABSTRACT. All elementary steps of a chemical reaction have been successfully induced on individual molecules with a scanning tunneling microscope (STM) in a controlled step-by-step manner utilizing a variety of manipulation techniques. The reaction steps involve the separation of iodine from iodobenzene by using tunneling electrons, bringing together two resultant phenyls mechanically by lateral manipulation and, finally, their chemical association to form a biphenyl molecule mediated by excitation with tunneling electrons. The procedures presented here constitute an important step towards the assembly of individual molecules out of simple building blocks in situ on the atomic scale. NOTE: This mechanosynthetic experiment demonstrated the formation of biphenyl on a copper (111) surface via the mechanical breaking of the iodobenzene carbon-iodine bond with tunneling electrons and mechanical positioning of the benzene radical into vicinity of a second benzene radical, all performed at 20 K. This first experiment demonstrated that chemical assembly is possible on a surface using positional control of the reactants by employing a weak chemical bond (carbon-iodine) that could be broken readily while the starting molecule was still bound to the surface. A reliance on large differences in chemical reactivity to aid in the control of a multi-step assembly process is a common motif in synthetic chemistry. ABSTRACT. The rapid progress in molecular manipulation with a scanning tunneling microscope (STM) tip opens up entirely new opportunities in nanoscience and technology. With these advances, the ultimate chemical reaction steps such as dissociation, diffusion, adsorption, readsorption, and bond-formation processes become possible to be performed by using the STM tip at the single molecule level with an atomic scale precision. By using a variety of manipulation techniques in a systematic and step by step manner, a complete chemical reaction sequence has been induced with the STM tip leading to the synthesis of molecules on an individual basis. In this paper, various STM manipulation techniques useful in the single molecule engineering process are reviewed, and their impact on the future of nanoscience and technology is discussed. ABSTRACT. The fascinating advances in single atom/molecule manipulation with a scanning tunneling microscope (STM) tip allow scientists to fabricate atomic-scale structures or to probe chemical and physical properties of matters at an atomic level. Owing to these advances, it has become possible for the basic chemical reaction steps, such as dissociation, diffusion, adsorption, readsorption, and bond-formation processes, to be performed by using the STM tip. Complete sequences of chemical reactions are able to induce at a single-molecule level. New molecules can be constructed from the basic molecular building blocks on a one-molecule-at-a-time basis by using a variety of STM manipulation schemes in a systematic step-by-step manner. These achievements open up entirely new opportunities in nanochemistry and nanochemical technology. In this review, various STM manipulation techniques useful in the single-molecule reaction process are reviewed, and their impact on the future of nanoscience and technology are discussed. ABSTRACT. The use of scanning probe microscopy-based techniques to manipulate single molecules and deliver them in a precisely controlled manner to a specific target represents a significant nanotechnological challenge. The ultimate physical limit in the design and fabrication of organic surfaces can be reached using this approach. Here we show that the atomic force microscope (AFM), which has been used extensively to investigate the stretching of individual molecules, can deliver and immobilize single molecules, one at a time, on a surface. Reactive polymer molecules, attached at one end to an AFM tip, are brought into contact with a modified silicon substrate to which they become linked by a chemical reaction. When the AFM tip is pulled away from the surface, the resulting mechanical force causes the weakest bond — the one between the tip and polymer — to break. This process transfers the polymer molecule to the substrate where it can be modified by further chemical reactions. NOTE: This is a demonstration of a mechanical placement and bond formation of a simple organic polymer onto a modified silicon surface with retraction of the AFM tip and breaking of the AMF/polymer interaction, thereby leaving the molecule chemically bound to the surface at 295 K. This first demonstration of nanoscale mechanochemistry combines positional control of reactants with bond formation governed by proximity of otherwise stable chemical moieties. This finding is significant to near-term mechanosynthetic approaches to nanoscale assembly as it demonstrates the combination of positional control of reactants with understood reaction mechanisms to yield site-specific changes to a chemical workspace (here, a functionalized silicon surface). Here the mechanical positioning of a small, chemically-stable polymer and formation of a surface-to-polymer amide bond generates a structure strong enough to allow for retraction of the mechanical delivery system (AFM tip), indicating that assembly processes can be designed and performed using raw materials that may be otherwise chemically stable systems. In effect, a building block need not be highly reactive, but only contain a chemical functionality sensitive to the proximity of other functional groups. ABSTRACT. We investigate the atomistic details of a single atom-extraction process realized by using the scanning tunneling microscope tip-cluster interaction on a Ag(111) surface at 6 K. Single atoms are extracted from a silver cluster one atom at a time using small tunneling biases less than 35 mV. Combined total energy calculations and molecular dynamics simulations show a lowering of the atom-extraction barrier upon approaching the tip to the cluster. Thus, a mere tuning of the proximity between the tip and the cluster governs the extraction process. The atomic precision and reproducibility of this procedure are demonstrated by repeatedly extracting single atoms from a silver cluster on an atom-by-atom basis. NOTE: This three-dimensional atomic disassembly of a small silver cluster on a silver (111) surface at 6 K using a scanning tunneling microscope is significant as a demonstration of the capability of three-dimensional control of disassembly at the atomic scale. In effect, this study is the first to apply envisioned top-down approaches for manufacturing complex structures via bulk material disassembly at the atomic level, the same scale at which envisioned bottom-up approaches may begin their fabrication processes. ABSTRACT. We introduce a method for the bottom-up assembly of biomolecular structures that combines the precision of the atomic force microscope (AFM) with the selectivity of DNA hybridization. Functional units coupled to DNA oligomers were picked up from a depot area by means of a complementary DNA strand bound to an AFM tip. These units were transferred to and deposited on a target area to create basic geometrical structures, assembled from units with different functions. Each of these cut-and-paste events was characterized by single-molecule force spectroscopy and single-molecule fluorescence microscopy. Transport and deposition of more than 5000 units were achieved, with less than 10% loss in transfer efficiency. NOTE: This paper is included in this bibliography as an example of positionally-controlled mechanosynthesis using complementary biological molecules, with 5000 individual molecules installed one by one as array elements on a planar grid to 10 nm positional accuracy using an AFM in aqueous medium. ABSTRACT. One of the key challenges in chemistry is to break and form bonds selectively in complex organic molecules that possess a range of different functional groups. To do this at the single-molecule level not only provides an opportunity to create custom nanoscale devices, but offers opportunities for the in-depth study of how the molecular electronic structure changes in individual reactions. Here we use a scanning tunnelling microscope (STM) to induce a sequence of targeted bond dissociation and formation steps in single thiol-based p-conjugated molecules adsorbed on a NiAl(110) surface. Furthermore, the electronic resonances of the resulting species were measured by spatially resolved electronic spectroscopy at each reaction step. Specifically, the STM was used to cleave individual acetyl groups and to form Au–S bonds by manipulating single Au atoms. A detailed understanding of the Au–S bond and its non-local influence is fundamentally important for determining the electron transport in thiol-based molecular junction. NOTE: "The feasibility of initiating a bond-specific reaction within a complex molecule with functional groups is more relevant to molecular nanotechnology, in areas such as molecular electronics, organic solar cells and nanomachines." Tunneling electrons are used to break bonds. ABSTRACT. Abstraction of terminal hydrogens on a diamond  surface by atomic hydrogen has been offered as the possible rate-determining elementary step in the mechanism of low-pressure diamond growth by chemical vapor deposition. We use ab initio multiconfiguration self-consistent-field methods to estimate the activation energy for this abstraction reaction. We do this by first computing features of the potential energy surface for hydrogen abstraction from gas-phase isobutane and then computing features of the potential energy surface for this same system imposing constraints that mimic those found in a diamond lattice. Our results indicate that, although 5.4 kcal/mol of the CH bond energy in isobutane is attributable to structural relaxation of the radical, most of this radical relaxation energy (4.5 kcal/mol of it) is realized even with geometric constraints similar to those in a diamond lattice. We therefore predict bonds to a diamond surface to be only about 1 kcal/mol stronger than corresponding bonds to a gas-phase tertiary-carbon atom. The effect of the geometrical constraints on the activation energy for the hydrogen abstraction reaction is even smaller: all but 0.2 kcal/mol of the gas-phase radical relaxation energy at the transition state is realized even with the imposition of lattice-type constraints. Our results therefore support the use in kinetic modeling or molecular dynamics simulations of activation energies taken from analogous gas-phase hydrocarbon reactions with little or no adjustment. ABSTRACT. Processes that use mechanical positioning of reactive species to control chemical reactions by either providing activation energy or selecting between alternative pathways will allow us to construct a wide range of complex molecular structures. An example of such a process is the abstraction of hydrogen from diamond surfaces by a radical species attached to a mechanical positioning device for synthesis of atomically precise diamond-like structures. In the design of a nanoscale, site-specific hydrogen abstraction tool, we suggest the use of an alkynyl radical tip. Using ab initio quantum-chemistry techniques including electron correlation we model the abstraction of hydrogen from dihydrogen, methane, acetylene, benzene and isobutane by the acetylene radical. Of these systems, isobutane serves as a good model of the diamond (111) surface. By conservative estimates, the abstraction barrier is small (less than 7.7 kcal mol-1) in all cases except for acetylene and zero in the case of isobutane. Thermal vibrations at room temperature should be sufficient to supply the small activation energy. Several methods of creating the radical in a controlled vacuum setting should be feasible. Thermal, mechanical, optical and chemical energy sources could all be used either to activate a precursor, which could be used once and thrown away, or alternatively to remove the hydrogen from the tip, thus refreshing the abstraction tool for a second use. We show how nanofabrication processes can be accurately and inexpensively designed in a computational framework. ABSTRACT. Reaction probabilities, cross sections, rate coefficients, frequency factors, and activation energies for hydrogen-atom abstraction from a hydrogen-covered C(111) surface have been computed using quantum wave packet and classical trajectory methods on the empirical hydrocarbon #1 potential hypersurface developed by Brenner. Upper bounds for the abstraction rates, activation energies, and frequency factors have been obtained for six different chemisorbed moieties on a C(111) diamond surface using a classical variational transition-state method. For the hydrogen-covered surface, the results of the wave packet/trajectory calculations give k(t) = 1.67 x 1014 exp(-0.46 eV/kbT) cm3/mol s, which is about a factor of 2.9 less than the gas-phase abstraction rate from tertiary carbon atoms at 1200 K. The variational calculations show that the activation energies for hydrogen-atom abstraction vary from 0.0 to 1.063 eV. Some sp2-bonded hydrogen atoms can be removed in a barrierless process if adjacent to a carbon radical. In contrast, abstractions that produce a methylene carbon are associated with much larger activation energies in the range 0.49-0.82 eV. Abstraction from nonradical chemisorbed ethylene structures of the type that might be formed by the chemisorption of acetylene at two lattice sites is a particularly slow process with a 1.063 eV activation energy. Hydrogen abstraction from sp3 carbon atoms have activation energies ~0.4 eV. The results suggest that phenomenological growth models which assume either an equilibrium distribution between surface hydrogen/H2 or a common abstraction rate for surface hydrogen atoms are unlikely to be accurate. ABSTRACT. The use of atomically-controlled reactive chemical forces via modified scanning-probe microscope tips provides a potentially powerful way of building nanodevices. In this work, we use atomistic simulations to explore the feasibility of one such system, namely the selective abstraction of hydrogen from a diamond surface using a tip with a chemisorbed ethynyl radical. We characterize reaction rates and energy flow at the tip, and conclude that they are sufficiently fast to make this approach feasible. We propose a novel tip design to perform the abstraction without inadvertently damaging the surface or probe tip. ABSTRACT. Results are reported from two molecular-dynamics simulations designed to yield insight into the engineering of nanometer-scale structures. The first is the initial stages of the indentation of a silicon substrate by an atomically-sharp diamond tip. Up to an indentation depth of approximately 0.6 nm the substrate responds elastically and the profile of the disturbed region of the substrate normal to the surface reflects the shape of the tip apex. The disturbed region in the plane of the surface, however, reflects the symmetry of the substrate rather than that of the tip. As indentation progresses the damage to the substrate becomes irreversible, and the profile of the damage normal to the substrate surface approximately matches that of the tip, while the in-plane profile appears roughly circular rather than displaying the symmetry of either the tip or substrate. The tip maintains its integrity throughout the simulation, which had a maximum indentation depth of 1.2 nm. The second study demonstrates patterning of a diamond substrate using a group of ethynyl radicals attached to a diamond tip. The tip is designed so that the terrace containing the radicals has an atomically-sharp protrusion that can protect the radicals during a tip crash. At contact between the tip and substrate the protrusion is elastically deformed, and five of six chemisorbed radicals abstract hydrogen atoms during the 1.25 picoseconds the tip is in contact with the surface. Displacement of the tip an additional 2.5 Å, however, results in permanent damage to the protrusion with little deformation of the substrate. A. Ricca, C.W. Bauschlicher Jr., J.K. Kang, C.B. Musgrave, “Hydrogen abstraction from a diamond (111) surface in a uniform electric field,” Surf. Sci. 429(1999):199-205. ABSTRACT. Bond breaking in a strong electric field is shown to arise from a crossing of the ionic and covalent asymptotes. The specific example of hydrogen abstraction from a diamond (111) surface is studied using a cluster model. The addition of nearby atoms in both the parallel and perpendicular direction to the electric field are found to have an effect. It is also shown that the barrier is not solely related to the position of the ionic and covalent asymptotes. Berhane Temelso, C. David Sherrill, Ralph C. Merkle, Robert A. Freitas Jr., “High-level Ab Initio Studies of Hydrogen Abstraction from Prototype Hydrocarbon Systems,” J. Phys. Chem. A 110(28 September 2006):11160-11173; http://pubs.acs.org/doi/abs/10.1021/jp061821e (ACS abstract), http://www.MolecularAssembler.com/Papers/TemelsoHAbst.pdf (paper). ABSTRACT. Symmetric and non-symmetric hydrogen abstraction reactions are studied using state-of-the-art ab initio electronic structure methods. Second-order Moller-Plesset perturbation theory (MP2) and the coupled-cluster singles, doubles and perturbative triples [CCSD(T)] methods with large correlation consistent basis sets (cc-pVXZ, where X = D,T,Q) are used in determining the transition-state geometries, activation barriers, and thermodynamic properties of several representative hydrogen abstraction reactions. The importance of basis set, electron correlation, and choice of zeroth-order reference wavefunction in the accurate prediction of activation barriers and reaction enthalpies are also investigated. The ethynyl radical (•CCH), which has a very high affinity for hydrogen atoms, is studied as a prototype hydrogen abstraction agent. Our high-level quantum mechanical computations indicate that hydrogen abstraction using the ethynyl radical is virtually barrierless for hydrogens bonded to an sp3 carbon and has a barrier of less than 3 kcal mol-1 for hydrogens bonded to an sp2 carbon. These low activation barriers further corroborate previous studies suggesting that ethynyl-type radicals would make good tooltips for abstracting hydrogens from diamondoid surfaces during mechanosynthesis. Modeling the diamond C(111) surface with isobutane and treating the ethynyl radical as a tooltip, hydrogen abstraction in this reaction is predicted to be barrierless. ABSTRACT. The terminal alkyne residue, -CequivC . H is one of the most acidic among the C-H groups (Pedireddy & Desiraju,1992). The ethynyl or propargyl radical formed by removing the terminal hydrogen in an alkyne is likely to have more affinity for hydrogen. It can be used for removing the hydrogen atoms at desired places from diamondoid structures in molecular manufacturing. Hence the terminal alkynes can be used as position abstraction tool for hydrogen in the production of nano materials (Musgrave et.al. 1991). The radical of a molecule having the ethynyl or propargyl group at the end can be embedded into structures that can act like the base of a handle. This arrangement can act as an excellent tool tip. Hydrogen bonding plays an important role in deciding the suitability of a terminal alkyne to act as a tool tip molecule. An analysis of the crystallographic and spectrosc opic data help us gain an insight into C-H...X hydrogen bond interactions (Desiraju 1991, Steiner 2003). The single crystal X ray diffraction studies reveal the three dimensional view of the molecule and provide the inter molecular C ... O distances. Infrared (IR) spectroscopy has a prominent place in the history of investigation of hydrogen bonding (Mootz and Deeg 1992). The choice of terminal acetelenes to act as a tool tip molecule can be made by taking into consideration the evidence obtained from crystallographic and spectroscopic data. The crystallographic (Lakshmi et al, 1996) and spectroscopic data of 7beta hydroxy -7alpha-(3-propargyl)-3-methyl-spiro[5.5]undec- 2-en-l-one are analysed. J.W. Lyding, K. Hess, G.C. Abeln, D.S. Thompson, J.S. Moore, M.C. Hersam, E.T. Foley, J. Lee, Z. Chen, S.T. Hwang, H. Choi, P.H. Avouris, I.C. Kizilyalli, “UHV-STM nanofabrication and hydrogen/deuterium desorption from silicon surfaces: implications for CMOS technology,” Appl. Surf. Sci. 130(June 1998):221-230. ABSTRACT: The development of ultrahigh vacuum–scanning tunneling microscopy (UHV–STM)-based nanofabrication capability for hydrogen passivated silicon surfaces has opened new opportunities for selective chemical processing, down to the atomic scale. The chemical contrast between clean and H-passivated Si(100) surfaces has been used to achieve nanoscale selective oxidation, nitridation, molecular functionalization, and metallization by thermal chemical vapor deposition (CVD). Further understanding of the hydrogen desorption mechanisms has been gained by extending the studies to deuterated surfaces. In these experiments, it was discovered that deuterium is nearly two orders of magnitude more difficult to desorb than hydrogen in the electronic desorption regime. This giant isotope effect provided the basis for an idea that has since led to the extension of complementary metal oxide semiconductor (CMOS) transistor lifetimes by factors of 10 or greater. Low temperature hydrogen and deuterium desorption experiments were performed to gain further insight into the underlying physical mechanisms. The desorption shows no temperature dependence in the high energy electronic desorption regime. However, in the low energy vibrational heating regime, hydrogen is over two orders of magnitude easier to desorb at 11 K than at room temperature. The enhanced desorption in the low temperature vibrational regime has enabled the quantification of a dramatic increase in the deuterium isotope effect at low voltages. These results may have direct implications for low voltage and/or low temperature scaled CMOS operation. ABSTRACT: A cryogenic UHV scanning tunneling microscope has been used to study the electron stimulated desorption of hydrogen and deuterium from Si(100) surfaces at 11 K. A strong isotope effect is observed, as seen previously at room temperature. Above ~5 eV, the desorption yields for H and D are temperature independent, while in the tunneling regime, below 4 eV, H is a factor of ~300 easier to desorb at 11 than at 300 K. This large temperature dependence is explained by a model that involves multiple vibrational excitation and takes into account the increase of the Si-H(D) vibrational lifetime at low temperature. M.C. Hersam, G.C. Abeln, J.W. Lyding, “An approach for efficiently locating and electrically contacting nanostructures fabricated via UHV-STM lithography on Si(100),” Microelectronic Engineering 47(June 1999):235-237. NOTE: Lyding's STM work involves either E field- or tunnel current (vibrational heating)-induced removal of adsorbed H atoms from Si(100), not purely mechanical positioning. ABSTRACT: A variable-temperature scanning tunneling microscope (STM) was used to initiate and observe the abstraction of a single hydrogen atom in a simple bimolecular reaction. Dicarbon (CC) on the Cu(001) surface reacted separately with hydrogen sulfide (H2S) and water (H2O) to form CCH + SH and CCH + OH, respectively. At 9 K, hydrogen abstraction from H2O occurred spontaneously upon contact between CC and thermally diffusing H2O molecules. Hydrogen abstraction from H2S was effected at 9 K by inducing H2S diffusion via excitation with tunneling electrons. The thermal diffusion and reaction of H2S and CC were also observed at 45 K. By removing a single hydrogen atom from H2S and H2O using tunneling electrons, we established the identities of the sulfhydryl (SH) and hydroxyl (OH) reaction products. SH and OH did not react with CC under conditions that led to the reaction of the parent molecules. The bimolecular reactions H2O + O —> 2OH and H2S + O —> SH + OH did not occur thermally at 9 K but were induced by tunneling electrons. ABSTRACT: Diamond has a number of unique chemical and physical properties. In particular, when covered with hydrogen, diamond surfaces acquire a negative electron affinity (NEA). This NEA property has already been used to fabricate high-efficiency diamond-based light detectors and/or electron emitters. We have used the scanning tunnelling microscope for (i) atomic-scale visualisation of the hydrogenated diamond surface, (ii) probing the surface electronic structure and (iii) atomic-scale desorption of hydrogen atoms. Desorption of individual hydrogen atoms has been used to pattern pre-selected areas on the hydrogenated diamond surface. This is considered to be a promising way to fabricate atomic-scale photon detectors and/or electron emitters. The feasibility of the tip-induced atomic-scale desorption of hydrogen from the diamond surface is discussed in comparison with the similar studies on hydrogenated silicon and germanium surfaces performed previously. NOTE: This work employed tunnel current flow, not mechanical forces, to break H bonds. ABSTRACT: Low-temperature scanning tunneling microscopy was used to selectively break the N-H bond of a methylaminocarbyne (CNHCH3) molecule on a Pt(111) surface at 4.7 kelvin, leaving the C-H bonds intact, to form an adsorbed methylisocyanide molecule (CNCH3). The methylisocyanide product was identified through comparison of its vibrational spectrum with that of directly adsorbed methylisocyanide as measured with inelastic electron tunneling spectroscopy. The CNHCH3 could be regenerated in situ by exposure to hydrogen at room temperature. The combination of tip-induced dehydrogenation with thermodynamically driven hydrogenation allows a completely reversible chemical cycle to be established at the single-molecule level in this system. By tailoring the pulse conditions, irreversible dissociation entailing cleavage of both the C-H and N-H bonds can also be demonstrated. NOTE: As with earlier work, this effort employed tunnel current flow, not purely mechanical forces, to break the H bond. Berhane Temelso, C. David Sherrill, Ralph C. Merkle, Robert A. Freitas Jr., “Ab Initio Thermochemistry of the Hydrogenation of Hydrocarbon Radicals Using Silicon, Germanium, Tin and Lead Substituted Methane and Isobutane,” J. Phys. Chem. A 111(15 August 2007):8677-8688. http://pubs.acs.org/doi/abs/10.1021/jp071797k (ACS abstract), http://www.MolecularAssembler.com/Papers/TemelsoHDon.pdf (paper). ABSTRACT. A series of reactions of the type Y• + XH4 —> YH + •XH3 and Y'• + HX(CH3)3 —> Y'H + •X(CH3)3 where Y=H, CH3; Y'=CH3, C(CH3)3; and X=Si, Ge, Sn, Pb are studied using state-of-the-art ab initio electronic structure methods. Second-order Möller-Plesset perturbation theory (MP2), the coupled-cluster singles, doubles and perturbative triples [CCSD(T)] method, and density functional theory (DFT) are used with correlation-consistent basis sets (cc-pVNZ, where N = D, T, Q) and their pseudopotential analogs (cc-pVNZ-PP) in order to determine the transition-state geometries, activation barriers, and thermodynamic properties of these reactions. Trends in the barrier heights as a function of the group IVA atom (Si, Ge, Sn, and Pb) are examined. With respect to kinetics and thermodynamics, the use of a hydrogen attached to a group IVA element as a possible hydrogen donation tool in the mechanosynthesis of diamondoids appears feasible. B.J. McIntyre, M. Salmeron, G.A. Somorjai, “Nanocatalysis by the tip of a scanning tunneling microscope operating inside a reactor cell,” Science 265(2 September 1994):1415-1418. ABSTRACT. The platinum-rhodium tip of a scanning tunneling microscope that operates inside of an atmospheric-pressure chemical reactor cell has been used to locally rehydrogenate carbonaceous fragments deposited on the (111) surface of platinum. The carbon fragments were produced by partial dehydrogenation of propylene. The reactant gas environment inside the cell consisted of pure H2 or a 1:9 mixture of CH3CHCH2 and H2 at 300 kelvin. The platinum-rhodium tip acted as a catalyst after activation by short voltage pulses. In this active state, the clusters in the area scanned by the tip were reacted away with very high spatial resolution. Wolfgang T. Muller, David L. Klein, Thomas Lee, John Clarke, Paul L. McEuen, Peter G. Schultz, “A strategy for the chemical synthesis of nanostructures,” Science 268(14 April 1995):272-273. ABSTRACT. Highly localized chemical catalysis was carried out on the surface groups of a self-assembled monolayer with a scanning probe device. With the use of a platinum-coated atomic force microscope tip, the terminal azide groups of the monolayer were catalytically hydrogenated with high spatial resolution. The newly created amino groups were then covalently modified to generate new surface structures. By varying the nature of the catalyst and the chemical composition of the surface, it may be possible to synthesize molecular assemblies not readily produced by existing microfabrication techniques. D.H. Huang, Y. Yamamoto, “Physical mechanism of hydrogen deposition from a scanning tunneling microscopy tip,” Appl. Phys. A 64(April 1997):R419-R422. ABSTRACT. We report on the first successful deposition of individual hydrogen atoms from a tungsten tip of a scanning tunneling microscope onto a monohydride Si(100)-221:H surface. Hydrogen atoms adsorbed on the tungsten tip are first diffused to the tip apex from the surroundings of the tip by the application of +3.5 V bias to the sample for ~300 ms, and subsequently deposited onto the surface by the application of -8.5 V 300 ms pulses to the sample. The physical mechanisms involved are hydrogen diffusion on the tip via field-gradient-induced diffusion and hydrogen deposition due to electronic excitation. C. Thirstrup, M. Sakurai, T. Nakayama, M. Aono, “Atomic scale modifications of hydrogen-terminated silicon 2 x 1 and 3 x 1 (001) surfaces by scanning tunneling microscope,” Surf. Sci. 411(1998):203-214. ABSTRACT. Atomic scale desorption and deposition of hydrogen (H) atoms on Si(001)-(2 x 1)-H and Si(001)-(3 x 1)-H surfaces have been studied using clean and H covered tips from a scanning tunneling microscope. We report desorption of H atoms from these surfaces at positive and negative sample bias voltages with a resolution of one to two atomic rows and atomic scale phase transitions from 3 x 1 structures to 2 x 1 structures and vice versa. At positive sample bias, phase transitions from the 3 x 1 to 2 x 1 structures are accompanied with a large number of dangling bonds on the newly crated 2 x 1 structures, because the desorption of H from the 2 x 1 structure occurs at a lower tunnel current than the formation of the phase transition. At negative sample bias -5 V, the situation is reversed with the desorption from the 2 x 1 structure occurring at a larger tunnel current than the formation of the phase transition, and “clean” local 2 x 1 structures with few dangling bonds can be achieved. Using H covered tips and increasing the substrate temperatures of Si(001)-(2 x 1)-H surfaces to approximate to 400 K, opposite local phase transitions from 2 x 1 structure to 3 x 1 structures are also reported, but such phase transitions were only observed at negative sample bias. ABSTRACT. We report the mechanically induced formation of a silicon-hydrogen covalent bond and its application in engineering nanoelectronic devices. We show that using the tip of a non-contact atomic force microscope (NC-AFM), a single hydrogen atom could be vertically manipulated. When applying a localized electronic excitation, a single hydrogen atom is desorbed from the hydrogen passivated surface and can be transferred to the tip apex as evidenced from a unique signature in frequency shift curves. In the absence of tunnel electrons and electric field in the scanning probe microscope junction at 0 V, the hydrogen atom at the tip apex is brought very close to a silicon dangling bond, inducing the mechanical formation of a silicon-hydrogen covalent bond and the passivation of the dangling bond. The functionalized tip was used to characterize silicon dangling bonds on the hydrogen-silicon surface, was shown to enhance the scanning tunneling microscope (STM) contrast, and allowed NC-AFM imaging with atomic and chemical bond contrasts. Through examples, we show the importance of this atomic scale mechanical manipulation technique in the engineering of the emerging technology of on-surface dangling bond based nanoelectronic devices. NOTE: This paper is the first published report of purely mechanosynthetic hydrogen donation, in this instance an H atom being bonded to an Si atom with a dangling bond, residing on an otherwise hydrogenated Si(100) surface, using mechanical force alone. The H atom was initially loaded onto the tip prior to donation using a bias voltage and not by a purely mechanical abstraction reaction. ABSTRACT. Density functional theory methods have been used to examine the interaction of i) the carbene and C2 tools with a pair of radical sites on the diamond (111) surface and ii) the carbene tool with a surface dimer on the reconstructed diamond (100) surface. For the (111) surface, the carbene tool (carbenecyclopropene) is found to bond preferentially to a single radical site (on top site) rather than at a bridged site. This means this tool is not useful for adding a carbon to diamond (111). The C2 tool, on the other hand, is found to add a bridged C2 molecule, through a series of steps which are overall exothermic. The carbene tool can add a carbon to the bridged C2 molecule, leading to a bridged C3 molecule perpendicular to the surface, by an overall exothermic series of steps. If another radical site is activated, the C3 can bend over to a three fold coordinated position, with only a small barrier. Thus, this series of steps can be used to create a three fold coordinated C3 molecule on the diamond (111) surface. For the surface dimer on the reconstructed (100) surface, the carbene tool is found to add with no barrier if the angle between the tool and the surface is allowed to vary or with a 0.09 aJ (13 kcal/mol) barrier for a C2v constrained approach. In this case, a bridged site is strongly favored, and the subsequent steps of sequentially breaking the p and s bonds between the tool and added carbon atom are all feasible. Thus, this series of steps can add a bridged C atom to the reconstructed diamond (100) surface. ABSTRACT. The interaction of a carbon nanotube tip with two chemically modified caps with a single-height-stepped C100-(2x1) diamond surface is studied by performing molecular dynamics simulations. The C2 and C6H2 radicals are attached to the end cap of nanotube. The forces for solving the classical equations of motion are derived from Brenner's many-body reactive potential. Depending on the surface impact site, the nanotube initial velocity towards the diamond surface, and the nanotube withdrawal rate a variety of mechanochemical reactions have been observed. The strong tip-surface interaction results in creation of chemically different nanostructures on the diamond surface for C6H2 tip, while the tip with C2 allows to remove a dimer of carbon atoms from the upper-terrace of diamond. The possibility of using nanotube with chemically modified caps for selective etching and nano-lithography on different semiconductor surfaces is discussed. ABSTRACT. Density functional theory is used with Gaussian 98 to analyze a new family of proposed mechanosynthetic tools that could be employed for the placement of two carbon atoms—a carbon-carbon (CC) dimer—on a growing diamond surface at a specific site. The analysis focuses on specific group IV-substituted biadamantane tooltip structures and evaluates their stability and the strength of the bond they make with the CC dimer. These tools should be stable in a vacuum and should be able to hold and position a CC dimer in a manner suitable for positionally controlled diamond mechanosynthesis at room temperature. NOTE: The DCB6 tooltip motif detailed here, initially disclosed at a Foresight Conference in 2002, was the first complete tooltip ever proposed (and computationally studied using ab initio techniques) for the positionally-controlled deposition of carbon atoms (as dimers) on a diamond surface. ABSTRACT. A theoretical investigation of the chemical vapor deposition (CVD) growth on clean diamond C(110) surfaces from carbon dimer precursors shows that isolated deposited C2 dimers appear stable at room temperature, but a second carbon dimer subsequently chemisorbed in close vicinity to the first can adopt one of 19 local energy minima, five of which require barriers >0.5 eV to reach the global minimum and thus constitute stabilized defects. Three chemisorbed C2 dimers can adopt one of 35 local minimum energy structures, ten of which are stable defects located in deep potential energy wells. The number of potential defects increases with the number of deposited carbon dimers which suggests an isolated rather than clustered growth mechanism in CVD on bare diamond C(110). These results also provide information regarding outcomes of the misplacement of a carbon dimer and establish constraints on the required dimer-placement positional precision that would be needed to avoid the formation of stable defects during diamond surface growth. ABSTRACT. This paper presents a computational and theoretical investigation of the vacuum mechanosynthesis of diamond on the clean C(110) surface from carbon dimer (C2) precursors positionally constrained throughout the reaction pathway by silicon- or germanium-doped triadamantane derivatives mounted on a scanning probe tip. Interactions between the dimer placement tools and the bare diamond C(110) surface are investigated using Density Functional Theory (DFT) with generalized gradient approximation (GGA) by constructing the reaction path potential energy profiles and analyzing ab initio molecular dynamics simulations. Similar methods are applied to study the energetics and kinetics of recharging the tool with acetylene. Molecular mechanics simulations on extended tool tips are carried out to elucidate the positional uncertainty of the carbon dimer due to thermal fluctuations, and the possibility of intermolecular dimerization and dehydrogenation of the dimer placement tools is explored. ABSTRACT. Mechanosynthesis of a target class of graphene-, nanotube-, and diamond-like structures will require molecular tools capable of transferring carbon moieties to structures that have binding energies per atom in the range of 1.105 to 1.181 aJ (159 to 170 kcal/mole). Desirable properties for tools include exoergic transfer of moieties to these structures, good geometrical exposure of moieties, and structural, electronic, and positional stability. We introduce a novel carbon-transfer tool design (DC10c), the first predicted to exhibit these properties in combination. The DC10c tool is a stiff hydrocarbon structure that binds carbon dimers through strained s-bonds. On dimer removal, diradical generation at the dimer-binding sites is avoided by means of p-delocalization across the binding face of the empty form, creating a strained aromatic ring. Transfer of carbon dimers to each of the structures in the target class is exoergic by a mean energy > 0.261 aJ per dimer (> 38 kcal/mole); this is compatible with transfer-failure rates ~ 10-24 per operation at 300 K. We present a B3LYP/6-31G(d,p) study of the geometry and energetics of DC10c, together with discussion of its anticipated reliability in mechanosynthetic applications. ABSTRACT. This paper extends an ongoing computational and theoretical investigation of the vacuum mechanosynthesis of diamond on a clean C(110) diamond surface from carbon dimer (C2) precursors, using Si-, Ge- and Sn-substituted triadamantane-based positionally-controlled DCB6 dimer placement tools. Interactions between the dimer placement tools and the C(110) surface are investigated by means of stepwise ab initio molecular dynamics (AIMD) simulations, using Density Functional Theory (DFT) with generalized gradient approximation (GGA), implemented in the VASP software package. The Ge-based tool tip provides better functionality over a wider range of temperatures and circumstances (as compared with the Si or Sn tool tips ). The transfer of a single carbon dimer from the Si-based tool tip onto C(110) is not controllable at 300 K but is workable at 80 K; the Ge-based tool remains workable up to 300 K. Geometry optimization suggests the Sn-based tool deposits reliably but the discharged tool is distorted after use; stepwise AIMD retraction simulations (at 300 K for the Sn tip) showed tip distortion with terminating Sn atoms prone to being attracted towards the surface carbon atoms. Stepwise AIMD shows successful placement of a second dimer in a 1-dimer gapped position, and successful intercalation of a third dimer into the 1-dimer gap between two previously deposited dimers, on clean C(110) at 300 K using the Ge tool. Maximum tolerable dimer misplacement error, investigated by stepwise AIMD quantification, is 0.5 Å in x (across trough) and 1.0 Å in y (along trough) for a positionally-correct isolated C2 deposition, and 1.0 Å in x and 0.3 Å in y for C2 intercalation between two gapped ad-dimers. Rotational misplacement tolerances for dimer placement are ±30° for the isolated dimer and -10°/+22.5° for the intercalated dimer in the xy plane, with a maximum tolerable “in plane” tip rolling angle of 32.5° and “out-of-plane” tip rocking angle of 15° for isolated dimer. Classical molecular dynamics (MD) analysis of a new Ge tooltip + handle system at 80 K and 300 K found that dimer positional uncertainty is halved by adding a crossbar in the most compliant direction. We conclude that the Si-based and Ge-based tools can operate successfully at appropriate temperatures, including up to room temperature for the Ge-based tool. NOTE: This paper reports that the most-studied mechanosynthesis tooltip motif (DCB6Ge) successfully places a C2 carbon dimer on a C(110) diamond surface at both 300K (room temperature) and 80K (liquid nitrogen temperature), and that the silicon variant (DCB6Si) also works at 80K but not at 300K. Maximum acceptable limits for tooltip translational and rotational misplacement errors are reported in the paper. Over 100,000 CPU hours were invested in this study. The DCB6 tooltip motif remains (in 2006) the only tooltip motif that has been successfully simulated for its intended function on a full (200-atom) diamond surface. ABSTRACT. After a systematic search for representative Ge-substituted polymantane-based carbon dimer (C2) placement tool motifs for positionally-controlled vacuum diamond mechanosynthesis (DMS) using semi-empirical (AM1) and classical molecular dynamics methods, 24 potentially useful tooltip structures were examined theoretically using Density Functional Theory (DFT) to assess dimer transfer energetics, identify accessible pathological structures, and evaluate all tooltip candidates using practical engineering design criteria including tool aspect ratio, vibrational stability, and protection from hydrogen poisoning. Members of this family of 24 tooltips should be stable in vacuum and should be able to hold and position a C2 dimer in a manner suitable for positionally-controlled dimer placement DMS reactions at room temperature. ABSTRACT. A method is described for building a mechanosynthesis tool intended to be used for the molecularly precise fabrication of physical structures -- as for example, diamond structures. An exemplar tool consists of a bulk-synthesized dimer-capped triadamantane tooltip molecule which is initially attached to a deposition surface in tip-down orientation, whereupon CVD or equivalent bulk diamond deposition processes are used to grow a large crystalline handle structure around the tooltip molecule. The large handle with its attached tooltip can then be mechanically separated from the deposition surface, yielding an integral finished tool that can subsequently be used to perform diamond mechanosynthesis in vacuo. The present disclosure is the first description of a complete tool for positional diamond mechanosynthesis, along with its method of manufacture. The same toolbuilding process may be extended to other classes of tooltip molecules, other handle materials, and to mechanosynthetic processes and structures other than those involving diamond. NOTE: This is the first U.S. patent ever issued for positional mechanosynthesis. ABSTRACT. The results of a combined molecular dynamics/quantum chemistry pathology study of previously reported organic (diamondoid) tooltips for diamondoid mechanosynthesis (DMS) are presented. This study, employing the NanoHive@Home (NH@H) distributed computing project, produced 80,000 tooltip geometries used in 200,000 calculations optimized at either the RHF/3-21G or RHF/STO-3G levels of theory based on geometries obtained from high-energy molecular dynamics simulations to produce highly deformed starting geometries. These 200,000 calculations have been catalogued, grouped according to energies and geometries, and analyzed to consider potentially accessible defect structures (pathologies) for tooltip geometries either binding a carbon dimer (C2) feedstock or not containing the transported dimer feedstock. The transport and deposition of feedstock and the stability of the tooltip between dimer “loading” cycles are important geometries that must be considered as part of a tooltip stability analysis. The NH@H framework is found to be a useful method both for the study of highly deforming covalent geometries and, using lower-temperature MD simulations, for generating and optimizing molecular conformations (demonstrated using biotin, n-heptane, and n-octane in this study). The results of the pathology survey are discussed and general considerations for the exploration of DMS tooltip usability are explored. ABSTRACT. According to Drexler, advanced mechanosynthesis will employ advanced nano-machines, but advanced nano-machines will themselves be products of advanced mechanosynthesis. This circular relationship must be broken via TBN technology development. In this article, the possibility of using easily available commercial CNT tips to assemble carbon-based intermediate generations of nano-devices is considered. Mechanosynthesis of a target class of carbon-based nano-devices will require molecular tools capable of transferring C2 molecules to reaction sites that have binding energies in the range of -6.9 to -7.4 eV per carbon atom or -7.6 to -8.6 eV per C2 molecule. Desirable properties of tools include approximately exoergic transfer of moieties to these structures; good geometrical exposure of moieties; and structural, electronic and positional stability. The results presented in this paper suggest that the CNT tips now available on the market have adequate properties to become tools for C2 molecule transfer into a reaction site during positional mechanosynthesis. The surpassing features of the commercial single/double wall capped CNT tips such as, small tip radii, extreme aspect ratio, excellent wear-out behavior and the average low temperature binding energy of C2 ~-5.0±1.2 eV make them the ideal tools for bridging the gap between present-day tip-based nanofabrication (TBN) and future implementation of advanced nanotechnology. A. Herman, “Towards mechanosynthesis of diamondoid structures. I. Quantum-chemical molecular dynamics simulations of silaadamantane synthesis on hydrogenated Si(111) surface with the STM,” Nanotechnology 8(September 1997):132-144. ABSTRACT. The controlled manipulation of silicon atoms and silylene molecules at the subnanometer scale via the scanning tunneling microscope (STM) tip provides a potentially powerful way of building silicon diamondoid structures. In this paper, we use quantum-chemical atomistic simulations to explore the feasibility of silaadamantane mechanosynthesis on a hydrogenated Si(111) surface using the STM tip. A sequence of energetically favorable insertion reactions is established leading to stable surface intermediates and finally to the simplest silicon diamondoid structure. The sequence is based solely on these three reactants with the overall charge neutrality of the structure maintained. We characterize reaction rates and energy flows, and conclude that they are sufficiently fast and simple to make this mechanosynthesis feasible. ABSTRACT. The controlled manipulation of silicon atoms and silylene molecules at the subnanometre scale via a scanning tunnelling microscope (STM) W tip provides a potentially powerful way of building silicon diamondoid structures. In this work, we use quantum-chemical atomistic simulations to explore the feasibility of mechanosynthesis on an hydrogenated Si(111) surface using a STM tip. A sequence of energetically favourable insertion reactions is established leading to stable surface intermediates. This sequence of operations is sufficient to build an indefinitely large volume of diamondoid lattice. The sequence is based solely on two reactants (Si and SiH2) with the overall charge neutrality of the structure maintained. We characterize reaction rates and energy flows and conclude that they are sufficiently fast and simple to make this mechanosynthesis feasible. ABSTRACT. The previously published (Modelling Simul. Mater. Sci. Eng., Vol. 7, 1999, pp. 43-58) strategy of silicon mechanosynthesis on an hydrogenated Si(111) surface has been extended by considering the caped SWCNT STM tip as silylene molecule and silicon atom positional control device. ABSTRACT. The previously published (Molecular Electronics and Molecular Electronic Devices, Vol. 1, Chap. 2, CRC Press, Inc. 1993, pp. 31-83) strategy of building polysilylene-based molecular electronic devices is extended in the direction of Ellenbogen's “Matter as Software” idea by considering the capped SWCNT STM tip as a device for manipulating silylene molecules. ABSTRACT. Using recently introduced by Drexler "lattice-scaled modulus" Klm, two potential nano-materials were compared, i.e., silicon and diamond. Detailed comparisons of physical and chemical properties have shown that silicon can be considered as the material of choice for a preliminary implementation of intermediate generation of nano-systems. ABSTRACT. A possibility to prototype the silicon-based intermediate generations of nano-devices using the STM caped SWCNT tip driven mechanosynthesis on hydrogen passivated Si(111), Si(110) and Si(100) surfaces was studied by means of the quantum-chemical molecular dynamics method. The proposed strategy is an additive positional molecular manufacturing process which uses a silicon atom (Si) and silylene molecule (SiH2 transfers from caped SWCNT tip to the reaction center on hydrogenated silicon surface to build parts of the silicon layer one at a time. Layers can be generated automatically from 3D CAD models used on the UHV STM machine, although nowadays they may also be manipulated manually. A recently published (J. Comput. Theor. Nanosci…) detailed comparison of physical and chemical properties of silicon and diamond has demonstrated that silicon can be considered as the material of choice for a preliminary implementation of intermediate generation of nano-systems. The work presented here suggests that the proposed prototyping technology can be used to manufacture production-quality parts of nano-systems in relatively small numbers. ABSTRACT. Tip manufacturers offer micro-fabricated silicon tips in three geometries, i.e., pyramidal, tetrahedral and conical. Conical tips can be made sharp, with high aspect ratios and radii as small as 50 Å. Pyramidal tips have lower aspect ratios and nominal tip radii of a few hundred angstroms, but they are more durable. However, even commercial conical tip manufacturers supply the tip structure only at the micrometer scale, and there is no direct method for imaging the very end of the tip, i.e., the “nano-tip.“ In this paper a very simple strategy of building atomically defined asperity on Si(111) surface of the commercial silicon tip is described. The strategy consists of four simple steps. In the first step, the silicon tip is irradiated with ultraviolet light in the atmosphere of oxygen to remove carbon contaminants. During the second step, a thermally oxidized SiO2 layer is eliminated by HF etching to sharpen the tip apex and hydrogenation of its surface. In the third step, controlled electron-stimulated desorption of hydrogen from the tip asperity surface is applied. Finally, in the step four, the C60 molecule docking to surface dangling bonds is performed. In the final part of this work PM6 modeling was used to show positional mechano-synthetic capabilities of the described SPM tip. ABSTRACT. As originally pointed out by Drexler, members of the broad class of diamondoids can differ from diamond both in respect to bonding pattern and elemental composition. In this paper the strategy of positional mechanosynthesis of hexagonal silicon-IV structures is studied by quantum-chemical molecular dynamics simulations. The estimated mechanosynthesis conditions together with the general knowledge of silicon chemistry suggest that the hexagonal polytype Si-IV, also termed as lonsdaleite Si, is probably readily accessible by UHV-SPM tip driven mechanosynthesis. ABSTRACT. According to Drexler, advanced mechanosynthesis will employ advanced nanomachines, but advanced nanomachines will themselves be a product of advanced mechanosynthesis. This circular relationship must be resolved via SPM technology development. In this article the possibility of using easily available commercial CNT tips to assembly silicon-based intermediate generations of nanodevices is considered. Mechanosynthesis of a target class of silicon-based nano-devices will require molecular tools capable of transferring SiH2 molecules and Si atoms to reaction centers that have binding energies within -2.9 ± 0.2 eV and -6.8 ± 0.3 eV, respectively. Desirable properties for tools include near exoergic transfer of moieties to these structures; good geometrical exposure of moieties; and structural, electronic, and positional stability. The results presented in this paper suggest that CNT tips presently available on the market have properties enabling them to become tools for silylene molecule and silicon atom transfer into a reaction center during positional mechanosynthesis. The surpassing features of the commercial single/double wall capped CNT tips, such as small tip radii, extreme aspect ratio, excellent wear-out behavior and the average binding energy of ~ -3.2 eV (for SiH2 and ~ -6.0 eV (for Si), make them ideal tools for bridging present day SPM technology and the future implementation of intermediate silicon-based nanotechnology. ABSTRACT: The desire to modify materials on the smallest possible scale is motivated by goals ranging from high-density information storage to the purposeful transformation of genetic material. Here we report an atomic-scale modification of the surface of a nearly perfect germanium crystal, effected by the tungsten tip of a tunnelling microscope. We believe this to be the smallest spatially controlled, purposeful transformation yet impressed on matter and we argue that the limit set by the discreteness of atomic structure has now essentially been reached. NOTE: Becker's work on STM-induced atomic manipulation makes use of electric fields of order 109 Vm-1, not reactive and/or rechargeable tooltips. The researchers could cause an atomic–scale bump on a germanium surface using a bias jump with a tungsten tip on a germanium (111) sample. Tip bias is -1V, tunnel current is 20pA; jump to -4V and let feedback settle to write. Feature size is 8Å across. Could not do this on silicon. Success rate varied from >90% to <10%; seemed better after tip was “recharged” by touching it to the surface. In-Whan Lyo, Phaedon Avouris, “Field-induced nanometer- to atomic-scale manipulation of silicon surfaces with the STM,” Science 253(12 July 1991):173-176. ABSTRACT. The controlled manipulation of silicon at the nanometer scale will facilitate the fabrication of new types of electronic devices. The scanning tunneling microscope (STM) can be used to manipulate strongly bound silicon atoms or clusters at room temperature. Specifically, by using a combination of electrostatic and chemical forces, surface atoms can be removed and deposited on the STM tip. The tip can then move to a predetermined surface site, and the atom or cluster can be redeposited. The magnitude of such forces and the amount of material removed can be controlled by applying voltage pulses at different tip-surface separations. ABSTRACT: In a scanning tunneling microscope (STM) operated in ultra-high vacuum, if we place a well-prepared W tip above the Si(111)-7× 7 surface at a separation of ˜1 nm and apply an appropriate voltage pulse to it, we can extract a single Si atom from a predetermined position routinely at room temperature. The extracted Si atoms are redeposited onto the surface with a certain probability, their positions always being at a fixed crystallographic site. The redeposited Si atoms can be displaced intentionally to other crystallographically equivalent sites. In case of the Si(001)-2× 1 surface, usually two Si atoms forming a dimer are extracted together. For both surfaces, Si atoms at crystallographically different sites including step edges are extracted with different probabilities. The microscopic mechanisms of these processes are discussed. NOTE: Aono's work also uses electric fields. This work demonstrated the ability to pick and place single Si atoms from Si(111)7x7 and Si(001)2x1 using W tip in UHV with a separation of about 1 nm when scanning and pulsing, and can routinely remove single atoms from specific locations. For Si(001), usually two atoms forming a dimer are removed. The sample is cleaned by flash heatings -- the tip is etched, electron–bombarded, and then pulsed to clean. The aparatus can remove single atoms with pulses or can cut grooves by scanning with raised bias. The whole QID pattern is made in a 50 nm area (no metal, just trenches in Si), with Si ions apparently being field evaporated from the surface. Polarity does not dominate, but has some effect due to the difference in critical field for + and - Si ions. Field strength, not current, causes change (they varied tunnel current without significant effects). They give the equations of field evaporation. The center adatoms in Si(111) were more easily removed. The fraction of atom re–deposition during extraction varies from negligible to about 19% based on pulse height. It is possible to move a deposited atom around using other nearby pulses. The deposited/moved atoms always land at the center of a triangle formed by a corner adatom and two adjacent center adatoms. ABSTRACT. The scanning tunneling microscope has been used to define regular crystalline structures at room temperature by removing atoms from the silicon (001) surface. A single atomic layer can be removed to define features one atom deep and create trenches with ordered floors. Segments of individual dimer rows can be removed to create structures with atomically straight edges and with lateral features as small as one dimer wide. Conditions under which such removal is possible are defined, and a mechanism is proposed. Dehuan Huang, Hironaga Uchida, Masakazu Aono, “Deposition and subsequent removal of single Si atoms on the Si(111)-7x7 surface by a scanning tunneling microscope,” J. Vac. Sci. Technol. B 12(July/August 1994):2429-2433. ABSTRACT. Single Si atoms can be deposited onto a Si(111)-7x7 sample surface from the tip of a scanning tunneling microscope, the Si atoms to be deposited being previously picked up by the tip from another place on the sample surface. The crystallographic position of these deposited Si atoms changes as their density increases. The deposited Si atoms can be re-removed by picking them up again with the tip, the substrate atomic arrangement remaining unperturbed. It is also possible to fill Si atom vacancies on the sample surface with a Si atom deposited from the tip. EXTRACT. The “far future” of Feynman began to be realized in the 1980s. Some of the capabilities he dreamed of have been demonstrated, while others are being developed. Although we are still far from having a general and reliable “atomic technology”, progress in the last 15 years or so has been tremendous. Here we describe some of these developments, starting with the isolation and manipulation of individual atoms. We then concentrate on atomic and molecular manipulation using the powerful scanning proximal probe techniques, such as the scanning tunneling microscope. ABSTRACT. A near contact atomic force microscope operated at low-temperature is used for vertical manipulation of selected single atoms from the Si(111)–(7×7) surface. The strong repulsive short-range chemical force interaction between the closest atoms of both tip apex and surface during a soft nanoindentation leads to the removal of a selected silicon atom from its equilibrium position at the surface without additional perturbation of the (7×7) unit cell. Deposition of a single atom on a created vacancy at the surface is achieved as well. These manipulation processes are purely mechanical, since neither bias voltage nor voltage pulse is applied between probe and sample. Differences in the mechanical response of the two nonequivalent adatoms of the Si(111)–(7×7) with the load applied is also detected. NOTE: This landmark paper is the first to report purely mechanical-based covalent bond-making and bond-breaking, i.e., the first experimental demonstration of true vacuum-phase mechanosynthesis. Morita S, Sugimoto Y, Oyabu N, Nishi R, Custance O, Sugawara Y, Abe M, “Atom-selective imaging and mechanical atom manipulation using the non-contact atomic force microscope,” J. Electron Microsc. (Tokyo) 53(2004):163-168. ABSTRACT. We succeeded in distinguishing between oxygen and silicon atoms on an oxygen-adsorbed Si(111)7 x 7 surface, and also distinguished between silicon and tin atoms on Si(111)7 x 7-Sn intermixed and Si(111) square root(3) x square root(3)-Sn mosaic-phase surfaces using non-contact atomic force microscopy (NC-AFM) at room temperature. Atom species of individual atoms are specified from the number of each atom in NC-AFM images, the tip-sample distance dependence of NC-AFM images and/or the surface distribution of each atom. Further, based on the NC-AFM method but using soft nanoindentation, we achieved two kinds of mechanical vertical manipulation of individual atoms: removal of a selected Si adatom and deposition of a Si atom into a selected Si adatom vacancy on the Si(111)7 x 7 surface at 78 K. Here, we carefully and slowly indented a Si atom on top of a clean Si tip apex onto a predetermined Si adatom to remove the targeted Si adatom and onto a predetermined Si adatom vacancy to deposit a Si atom, i.e. to repair the targeted Si adatom vacancy. By combining the atom-selective imaging method with two kinds of mechanical atom manipulation, i.e. by picking up a selected atom species and by depositing that atom one by one at the assigned site, we hope to construct nanomaterials and nanodevices made from more than two kinds of atom species in the near future. NOTE: This is another experimental demonstration of true mechanosynthesis, using silicon (Si) adatoms on Si surface. ABSTRACT. Recently, noncontact atomic force microscopy was used for performing controlled mechanical vertical manipulation of selected single atoms on a surface for the first time. In that work a soft and controlled nanoindentation of a Si tip on selected positions of the surface was used for the extraction of single adatoms, as well as for the deposition of single atoms in a previously created vacancy on the Si(111)-(7x7) surface. However, those experiments were performed using constant excitation mode for driving the cantilever oscillation, making the analysis of the interaction force involved in the vertical manipulation process difficult. In the present contribution, we report on the mechanical vertical manipulation of selected single atoms of the Ge(111)-c(2x8) surface, but using constant amplitude mode. Manipulation experiments removing single atoms from the surface, and depositing single atoms coming from the tip in a previously created vacancy on the Ge(111)-c(2x8) surface using a semiconductor tip will be presented. To apply the inverse procedure proposed by Giessibl to the frequency shift vs. tip-surface distance curves associated with the manipulation processes allows us to obtain information and present a discussion about the forces before and after the manipulation event, and the energy dissipated in the process. NOTE: This paper reports purely mechanical-based covalent bond-making and bond-breaking (true mechanosynthesis) involving germanium (Ge) atoms on Ge surface. ABSTRACT. Experimental results on the lateral manipulation of single atoms at semiconductor surfaces using non-contact atomic force microscopy (NC-AFM) are presented. These experiments prove that deposited adsorbates on top of a surface, as well as intrinsic adatoms of semiconductor surfaces, are suitable for being manipulated using the short-range interaction force acting between the outermost atoms of a semiconductor tip and the atoms at the surface. The analysis of the data from some of the experiments presented here indicates a pulling process of the tip on the manipulated atoms. The atom-by-atom creation, at room temperature, of patterns composed by a few inherent atoms of a heterogeneous surface is also presented. NOTE: The authors "achieved fully controlled lateral atom manipulation of single Ge atom adsorbed on a Ge(111)-c(2 × 8) surface at LT (80 K). In these purely mechanical atom manipulation sessions, at first, they precisely decreased the tip-sample distance and changed from the noncontact to the near-contact region, where only a single targeted surface atom could be mechanically manipulated. For lateral manipulation of adsorbed single Ge atoms, they found that a tip-sample distance change of ca. 6 pm under 9.3 nm amplitude oscillations, which changed the attractive force alternately between ca. 0.8 and 1.0 nN, could stably and reproducibly switch the lateral atom manipulation on and off." ABSTRACT. By combining dynamic force microscopy experiments and first-principles calculations, we have studied the adhesion associated with a single atomic contact between a nanoasperity – the tip apex – and a semiconductor surface – the Ge(111)-c(2×8). The nanoasperity's termination has been atomically characterized by extensive comparisons of the measured short-range force at specific sites with the chemical forces calculated using many atomic models that vary in structure, composition, and relative orientation with respect to the surface. This thorough characterization has allowed us to explain the dissipation signal observed in atomic-resolution images and force spectroscopic measurements, as well as to identify a dissipation channel and the associated atomic processes. Sugimoto Y, Pou P, Abe M, Jelinek P, Perez R, Morita S, Custance O, “Chemical identification of individual surface atoms by atomic force microscopy,” Nature 446(1 March 2007):64-67. ABSTRACT. Scanning probe microscopy is a versatile and powerful method that uses sharp tips to image, measure and manipulate matter at surfaces with atomic resolution. At cryogenic temperatures, scanning probe microscopy can even provide electron tunnelling spectra that serve as fingerprints of the vibrational properties of adsorbed molecules and of the electronic properties of magnetic impurity atoms, thereby allowing chemical identification. But in many instances, and particularly for insulating systems, determining the exact chemical composition of surfaces or nanostructures remains a considerable challenge. In principle, dynamic force microscopy should make it possible to overcome this problem: it can image insulator, semiconductor and metal surfaces with true atomic resolution, by detecting and precisely measuring the short-range forces that arise with the onset of chemical bonding between the tip and surface atoms and that depend sensitively on the chemical identity of the atoms involved. Here we report precise measurements of such short-range chemical forces, and show that their dependence on the force microscope tip used can be overcome through a normalization procedure. This allows us to use the chemical force measurements as the basis for atomic recognition, even at room temperature. We illustrate the performance of this approach by imaging the surface of a particularly challenging alloy system and successfully identifying the three constituent atomic species silicon, tin and lead, even though these exhibit very similar chemical properties and identical surface position preferences that render any discrimination attempt based on topographic measurements impossible. Sugimoto Y, Jelinek P, Pou P, Abe M, Morita S, Perez R, Custance O, “Mechanism for room-temperature single-atom lateral manipulations on semiconductors using dynamic force microscopy,” Phys. Rev. Lett. 98(9 March 2007):106104. ABSTRACT. Vacancy-mediated lateral manipulations of intrinsic adatoms of the Si(111)-(7x7) surface at room temperature are reported. The topographic signal during the manipulation combined with force spectroscopy measurements reveals that these manipulations can be ascribed to the so-called pulling mode, and that the Si adatoms were manipulated in the attractive tip-surface interaction regime at the relatively low short-range force value associated to the manipulation set point. First-principles calculations reveal that the presence of the tip induces structural relaxations that weaken the adatom surface bonds and manifests in a considerable local reduction of the natural diffusion barriers to adjacent adsorption positions. Close to the short-range forces measured in the experiments, these barriers are lowered near the limit that enables a thermally activated hopping at room temperature. ABSTRACT. The ability to incorporate individual atoms in a surface following predetermined arrangements may bring future atom-based technological enterprises closer to reality. Here, we report the assembling of complex atomic patterns at room temperature by the vertical interchange of atoms between the tip apex of an atomic force microscope and a semiconductor surface. At variance with previous methods, these manipulations were produced by exploring the repulsive part of the short-range chemical interaction between the closest tip-surface atoms. By using first-principles calculations, we clarified the basic mechanisms behind the vertical interchange of atoms, characterizing the key atomistic processes involved and estimating the magnitude of the energy barriers between the relevant atomic configurations that leads to these manipulations. NOTE: This paper reports purely mechanical-based covalent bond-making and bond-breaking (true vacuum-phase mechanosynthesis) involving atom by atom substitution of silicon (Si) atoms for tin (Sn) atoms in an Sn monolayer surface on a Si(111) surface; also demonstrates atomically precise exchange of lead (Pb) and indium (In) on Si(111) surface. This is the first report of a complex pattern being drawn on a 2D surface, literally atom by atom, purely via mechanical forces. ABSTRACT. Molecular manufacturing should let us synthesize most arrangements of atoms that are consistent with physical law. Assemblers have been proposed as a means for accomplishing this objective. They would be able to build a wide range of useful products as well as copies of themselves. A simpler though less general proposal is a hydrocarbon assembler, restricted to manufacturing relatively stiff hydrocarbons. The design and analysis of such an assembler should be substantially simpler than that of a more general assembler. In this paper, we consider the "intermediary metabolism" of a hydrocarbon assembler, i.e., the set of reactions that permit processing of the feedstock molecules and their conversion into molecular tools (positionally controlled carbenes, radicals, and other reactive species). The specific feedstock molecule analyzed is butadiyne (a linear molecule, C4H2, also known as diacetylene; not to be confused with the more common but chemically distinct non-linear molecule butadiene: C4H6). ABSTRACT. Based on the discrete variational method with the local-density-functional approximation, we chose cluster models to simulate the extraction of a single Al atom from Al(111) sample surface by a scanning-tunneling microscopy W tip with and without external bias voltages. Our cluster calculations, which can deal with the detailed geometry of the sample and the tip (especially with an active site), can provide useful and relatively reliable results: (1) The “chemical interactions” between the sample and the tip play an important role in single-atom extraction processes; e.g., an Al atom can be extracted as the tip-sample separation becomes 10 a.u. (5.3 Å) without any external fields. (2) The polarity and the value of the external bias (near the threshold) are other important factors; e.g., at the tip-sample separation 12 a.u., an Al atom can be extracted with the threshold field (0.6 V/Å, positive bias to the sample), and the extracted Al atom can be put back with a negative bias to the sample. (3) The W atom on the tip cannot be extracted. NOTE: This is the first proposed purely mechanosynthetic aluminum extraction tool. ABSTRACT. This paper presents the first theoretical quantitative systems level study of a complete suite of reaction pathways for scanning-probe based ultrahigh-vacuum diamond mechanosynthesis (DMS). A minimal toolset is proposed for positionally controlled DMS consisting of three primary tools – the (1) Hydrogen Abstraction (HAbst), (2) Hydrogen Donation (HDon), and (3) Dimer Placement (DimerP) tools – and six auxiliary tools – the (4) Adamantane radical (AdamRad) and (5) Germyladamantane radical (GeRad) handles, the (6) Methylene (Meth), (7) Germylmethylene (GM), and (8) Germylene (Germ) tools, and (9) the Hydrogen Transfer (HTrans) tool which is a simple compound of two existing tools (HAbst+GeRad). Our description of this toolset, the first to exhibit 100% process closure, explicitly specifies all reaction steps and reaction pathologies, also for the first time. The toolset employs three element types (C, Ge, and H) and requires inputs of four feedstock molecules – CH4 and C2H2 as carbon sources, Ge2H6 as the germanium source, and H2 as a hydrogen source. The present work shows that the 9-tooltype toolset can, using only these simple bulk-produced chemical inputs: (1) fabricate all nine tooltypes, including their adamantane handle structures and reactive tool intermediates, starting from a flat passivated diamond surface or an adamantane seed structure; (2) recharge all nine tooltypes after use; and (3) build both clean and hydrogenated molecularly-precise unstrained cubic diamond C(111)/C(110)/C(100) and hexagonal diamond surfaces of process-unlimited size, including some Ge-substituted variants; methylated and ethylated surface structures; handled polyyne, polyacetylene and polyethylene chains of process-unlimited length; and both flat graphene sheet and curved graphene nanotubes. Reaction pathways and transition geometries involving 1620 tooltip/workpiece structures were analyzed using Density Functional Theory (DFT) in Gaussian 98 at the B3LYP/6-311+G(2d,p) // B3LYP/3-21G* level of theory to compile 65 Reaction Sequences comprised of 328 reaction steps, 354 unique pathological side reactions and 1321 reported DFT energies. The reactions should exhibit high reliability at 80 K and moderate reliability at 300 K. This toolset provides clear developmental targets for a comprehensive near-term DMS implementation program. NOTE: First paper to propose a complete set of atomically precise mechanosynthetic reactions for building diamond. See also video presentation. ABSTRACT. The use of precisely applied mechanical forces to induce site-specific chemical transformations is called positional mechanosynthesis, and diamond is an important early target for achieving mechanosynthesis experimentally. A key step in diamond mechanosynthesis (DMS) employs an ethynyl-based hydrogen abstraction tool (HAbst) for the site-specific mechanical dehydrogenation of H-passivated diamond surfaces, creating an isolated radical site that can accept adatoms via radical-radical coupling in a subsequent positionally controlled reaction step. The abstraction tool, once used (HAbstH), must be recharged by removing the abstracted hydrogen atom from the tooltip, before the tool can be used again. This paper presents the first theoretical study of DMS tool-workpiece operating envelopes and optimal tooltip trajectories for any positionally controlled reaction sequence – and more specifically, one that may be used to recharge a spent hydrogen abstraction tool – during scanning-probe based ultrahigh-vacuum diamond mechanosynthesis. Trajectories were analyzed using Density Functional Theory (DFT) in PC-GAMESS at the B3LYP/6-311G(d,p) // B3LYP/3-21G(2d,p) level of theory. The results of this study help to define equipment and tooltip motion requirements that may be needed to execute the proposed reaction sequence experimentally and provide support for early developmental targets as part of a comprehensive near-term DMS implementation program. NOTE: First published theoretical study of DMS tool-workpiece operating envelopes and optimal tooltip trajectories for a complete positionally controlled reaction sequence. ABSTRACT. The use of precisely applied mechanical forces to induce site-specific chemical transformations is called positional mechanosynthesis, and diamond is an important early target for achieving mechanosynthesis experimentally. The next major experimental milestone may be the mechanosynthetic fabrication of atomically precise 3D structures, creating readily accessible diamond-based nanomechanical components engineered to form desired architectures possessing superlative mechanical strength, stiffness, and strength-to-weight ratio. To help motivate this future experimental work, the present paper addresses the basic stability of the simplest nanoscale diamond structures – cubes and octahedra – possessing clean, hydrogenated, or partially hydrogenated surfaces. Computational studies using Density Functional Theory (DFT) with the Car-Parrinello Molecular Dynamics (CPMD) code, consuming ~1,466,852.53 CPU-hours of runtime on the IBM Blue Gene/P supercomputer (23 TFlops), confirmed that fully hydrogenated nanodiamonds up to 2 nm (~900-1800 atoms) in size having only C(111) faces (octahedrons) or only C(110) and C(100) faces (cuboids) maintain stable sp3 hybridization. Fully dehydrogenated cuboid nanodiamonds above 1 nm retain the diamond lattice pattern, but smaller dehydrogenated cuboids and dehydrogenated octahedron nanodiamonds up to 2 nm reconstruct to bucky-diamond or onion-like carbon (OLC). At least three adjacent passivating H atoms may be removed, even from the most graphitization-prone C(111) face, without reconstruction of the underlying diamond lattice. ABSTRACT. The use of precisely applied mechanical forces to induce site-specific chemical transformations is called positional mechanosynthesis, and diamond is an important early target for achieving mechanosynthesis experimentally. The next major experimental milestone may be the mechanosynthetic fabrication of atomically precise 3D structures, creating readily accessible diamond-based nanomechanical components engineered to form desired architectures possessing superlative mechanical strength, stiffness, and strength-to-weight ratio. To help motivate this future experimental work, the present paper addresses the basic stability of nanoscale diamond structures with clean or hydrogenated surfaces that possess certain simple features including ledges, steps, and corners. Computational studies using Density Functional Theory (DFT) with the Car-Parrinello Molecular Dynamics (CPMD) code, consuming ~2,284,108.97 CPU-hours of runtime on the IBM Blue Gene/P supercomputer (23 TFlops), confirm that fully hydrogenated nanodiamonds 1-2 nm in size possessing ledges with various combinations of convex or concave edgelines where any two of the three principal diamond faces meet will maintain stable sp3 hybridization. ABSTRACT. The use of precisely applied mechanical forces to induce site-specific chemical transformations is called positional mechanosynthesis, and diamond is an important early target for achieving mechanosynthesis experimentally. A key step in diamond mechanosynthesis (DMS) may employ a Ge-substituted adamantane-based hydrogen donation tool (HDon) for the site-specific mechanical hydrogenation of depassivated diamond surfaces. This paper presents the first theoretical study of DMS tool-workpiece operating envelopes and optimal tool approach trajectories for a positionally controlled hydrogen donation tool during scanning-probe based UHV diamond mechanosynthesis. Trajectories were analyzed using Density Functional Theory (DFT) in PC-GAMESS at the B3LYP/6-311G(d,p) // B3LYP/3-21G(2d,p) level of theory. The results of this study help to define equipment and tooltip motion requirements that may be needed to execute the proposed reaction sequence experimentally and provide support for early developmental targets as part of a comprehensive near-term DMS implementation program. Shigeki Kawai, Adam S. Foster, Filippo Federici Canova, Hiroshi Onodera, Shin-ichi Kitamura, Ernst Meyer, “Atom manipulation on an insulating surface at room temperature,” Nat. Commun. 5(2014):4403, doi: 10.1038/ncomms5403. ABSTRACT. Sizes of computer components are reaching nanoscale dimensions, causing physical limitations to be met in traditional computer architectures. This study surveys the field of alternative nanocomputer architectures, including the nano-mechanical computational machines first proposed by Eric Drexler. A high-level XML programming language, MolML, is introduced as a scripting language for hydrocarbon assembly of mechanical nanocomputers. ABSTRACT. Computer component fabrication is approaching physical limits of traditional photolithographic fabrication techniques. An alternative computer architecture may be enabled by the rapidly maturing field of nanotechnology, and consist of nanomechanical computational machines similar to those first proposed by Eric Drexler, or other nanoscale components. In this study, we propose the design of a nanocompiler which targets a simulated hydrocarbon assembler. The compiler framework and resulting nano-mechanical machine is simulated using a component-level Colored Petri Net model of a 32-bit adder and an atomic-level gate simulator. Future work is proposed to extend the framework to simulate a full range nano-mechanical processing components. ABSTRACT. The ability to intentionally manipulate three-dimensional (3-D) irregular-shaped matter with atomic precision, abiding to physical laws, is considered as one of the ultimate goals of nanoscience and engineering. Nature has given us a vast assortment of biological molecular machines that demonstrate the viability of this goal, including, among others, the ribosome (which can translate mRNA instructions into proteins) and kinesin, an enzyme that acts as a molecular motor which pulls things toward the outer reaches of the cell. In nerve cells, it is kinesin that pulls vesicles or other cellular materials from the cell body to the nerve endings. These biological systems are primarily “application-specific molecular machines.” They are not universal assemblers that could, in principle, be used in a programmable fashion to perform alternate functions at the molecular level. Self-replicating programmable manufacturing systems able to arrange atoms for multiple “applications” would require a universal assembler with an appropriate end-effector and a corresponding controller. The scope of this entry explores design criteria for such a universal assembler. This article reviews the literature on the creation of nanometer-scale spatial positioners, from a kinematic and dynamic standpoint, as one of the basic building blocks for an atomic-scale manipulator (to arrange differently functionalized molecular building blocks into a lattice or any other nanometer-scale object in a specified and complex pattern, it is necessary to introduce positional control). The development of theoretical criteria for the design of reduced constrained dynamic complexity of a nanoscale positioning device (nanomanipulator), based on the equations of motion (EOM) for spatial serially articulated rigid multibodies, is presented in this article. By using a rigid-body semiclassical mechanics approach, it is shown how dynamic complexities, such as coupling and nonlinearities introduced by high-speed operation, complicate the control task and deteriorate performance. The first section of the article introduces the reader to appropriate state space forms of the EOM for a serially coupled set of rigid bodies using internal coordinates. This allows a compact mathematical description of the problem at hand and exposes the intended solution by permitting concise physical insight. The second section develops the complete set of EOM for both the Newton–Euler and Lagrange–Euler formulations. From the state space equivalence of both methods, the EOM are then expressed as a function of the articulated body inertia operator for the multibody, leading to a highly dependent form of the EOM on this operator. The internal matrix structure of the articulated body inertia is then revealed. The third section presents the analysis that leads to a reduced set of EOM from the structural simplification of the articulated body inertia matrix and develops the general kinematics and mass distribution criteria for doing so. From the resulting analysis, a set of compliant manipulator configurations that could, in principle, be built from carbon nanotubes, linked by direct-driven rotational molecular joints, is shown. Finally, the last section concludes on the obtained results and describes current and future work. ABSTRACT. Purpose - This paper aims to provide an overview of the strategies and techniques being used and developed for the fabrication of nanoscale devices. Design/methodology/approach - This paper discusses various nanofabrication technologies and strategies and highlights their merits and limitations. It concludes with a consideration of longer-term possibilities. Findings - It is shown that top-down nanofabrication frequently uses lithographic and other techniques derived from the microtechnology industry but recent research appears to have identified a limit to its capabilities. Bottom-up nanofabrication is less well-developed but techniques such as molecular mechanosynthesis may offer unique capabilities in the longer-term. Originality/value - The paper provides a timely review of the rapidly developing field of nanofabrication technology.